I've previously read and enjoyed Jesse Teller's Manhunters trilogy (Song, Hemlock, Crown), so naturally I was excited to read something new from him. 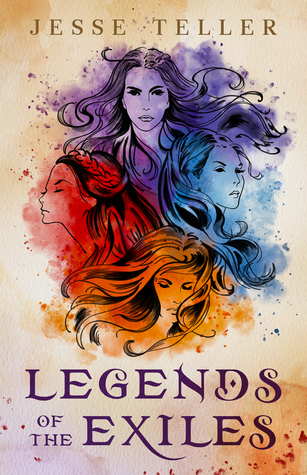 I was even more excited when I discovered that Legend of the Exiles is a tale of four interwoven novellas that take place in the world of Perilisc, each focusing on one individual woman. I wasn't sure what to expect from this format, but I knew that it was in good hands with Teller. The stories take place in a low fantasy setting that has been fully built up and explored in his previous trilogy, but that doesn't mean that these stories lack in setting up a great world as well that I was easily able to find myself lost within. Even though I have knowledge of the world from previous books, I think anyone new to Teller's work should have no problems jumping right in. There's no major info-dumping, but there's enough world-building to give readers a solid foundation for understanding and enjoying the world. I really enjoyed reading about all four of these women and found all the themes they struggled with extremely compelling, whether I could personally relate to them or not. Ellen's story in particular stood out to me, and I was so pleasantly surprised by how well Teller navigated the topics involved. The other three women, Helena, Jocelyn, and Rachel, also bring great lessons and personality to the book. Each story starts out with an exploration of a general struggle that each woman is currently facing, but the result of the story leaves both the reader and the character making new discoveries about their individuality and how they have the strength to handle everything. The only minor issue I had was that I wish the there was a lot of the women/narrative telling the us the readers about their strength, rather than showing as much as they could have. Within these stories, Teller tackles a wide variety of difficult topics and does a great job of exploring them and handling them in tactful and engaging ways. One of my favorite things was how Teller managed to keep them intertwined. It wasn't always overt, but there were many subtle mentions that added to both previous and future stories in ways that I thought were really clever. Overall, I've given Legend of the Exiles four stars! If you're looking for some stories about incredible women, then look no further.